Do you want special posters and merchandises designed to promote your company? 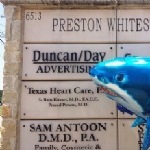 Then Duncan/Day Advertising in Plano, Texas is the right place for you. Our graphic designers can create all kinds of digital as well as non-digital designs for you.